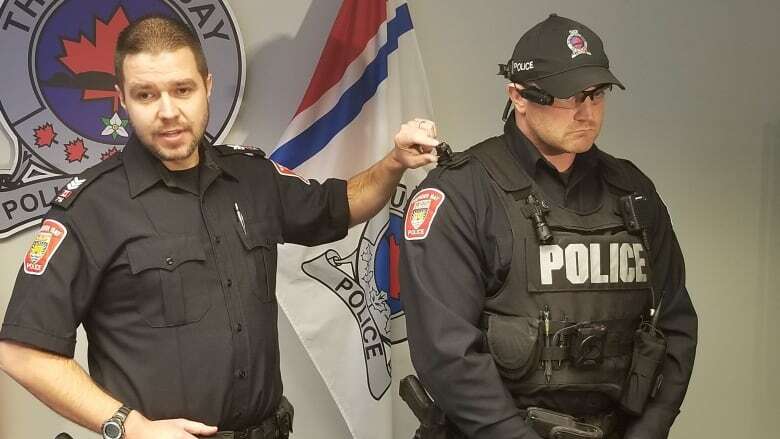 Thunder Bay police will be testing out body-mounted cameras on some officers over the coming months. Six officers in the police traffic unit will participate in the pilot project, which will officially begin on Tuesday, Nov. 13, said police Traffic Sgt. Gordon Snyder. "I think this is a great project," he said. "Our officers in the traffic unit are very supportive of it; they want to have their daily duties and interactions with the public recorded." "They're looking forward to getting started with the project." The cameras themselves can be worn in several ways, Snyder said, including on the side of ballcaps or glasses. "Whatever they're looking at, the camera will also capture," he said. "From a traffic perspective, if they're at an intersection ... looking into a vehicle beside them and somebody's on their cell phone or has a cell phone in their hand, the camera's also going to capture that evidence." 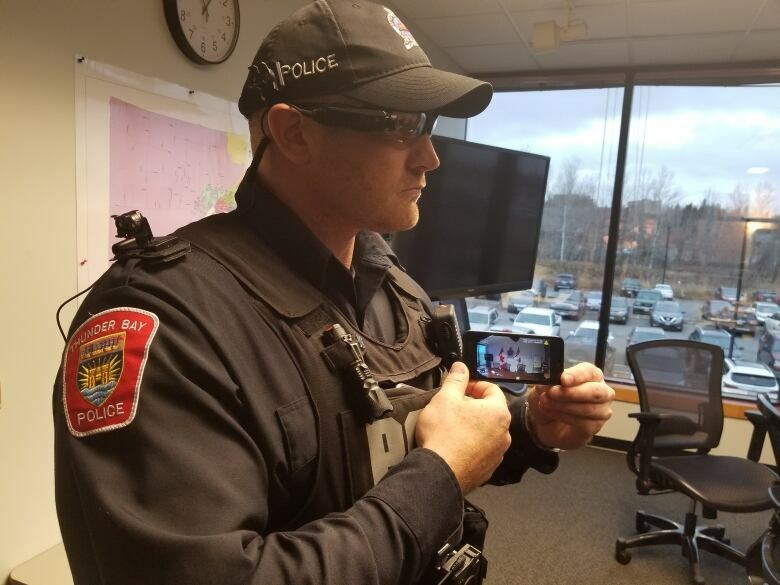 Snyder said the cameras also operate on a 30-second loop, so when an officer hits the record button, the saved recording will begin 30 seconds prior to that moment. "Where that's useful is in situations where, obviously, they observe an offence occur right in front of them," Snyder said. "They hit the record button, and the offence is actually captured on video at that point." Snyder said the expectation is officers will have the cameras turned on whenever they're dealing with the public, in a public area. That includes responding to calls or traffic stops, for example. Snyder said advances in technology prompted Thunder Bay police to try the cameras out. In the past, management of the "massive" amount of data captured by body-mounted cameras was a concern, but now, that's much easier and more cost-effective. "Now, all of this data is being uploaded to a secured cloud," Snyder said. "This data can then be disclosed through the court process to the Crown Attorney's office much easier, without officers having to have to burn CDs or DVDs to submit it." Snyder said the cameras will enhance the ability of officers to collect evidence. "Also, in conjunction with that, this also enhances the transparency and public trust of our police service," he said. "We are showing what we are doing, we are accountable for our actions, and it also makes ... a much-quicker resolution to situations when there's allegations made against police." Snyder said privacy is also a consideration. "Police gather a large amount of information, even prior to anything to do with body-worn cameras," he said. "This is no different." "We have a process in place that follows the Ontario legislation in regards to the release of personal information, and that process is not going to change." Police will also be testing out in-car cameras in three traffic unit cruisers, as well. Snyder said they'll start being used in the coming weeks. There will be no cost to the police service for the pilot project, as the manufacturer is providing the cameras free of charge for the duration, Snyder said.